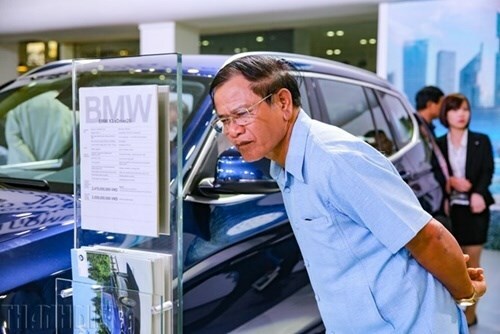 Hanoi (VNA) - Auto importers in Vietnam petitioned the Prime Minister and relevant sectors to consider problems related to some revised articles and supplements in the Law on Special Consumption Tax, which will become effective on July 1. This is the second change of the tax calculation this year. The first was put into effect in January 1. The changes, which were made in such a short time, reportedly made it difficult for auto businesses to set up their future plans. The petitioners are official suppliers of giant automakers in the world, including Audi, Bentley and Lamborghini, BMW and Mini, Jaguar and Land Rover, Luxgen and Baic, Maserati, Renault, Rolls-Royce, Subaru and Volkswagen. In an urgent petition sent to the Prime Minister, the Ministries of Industry and Trade and Finance, and the National Assembly’s Economic and Budget Committee, they said the application of the revised law would face problems because the new tax calculation was unclear. According to the current tax calculation method issued by a Government decree, which went into effect in January, the special consumption tax increased 5 percent in the price of imported cars. However, this will change on July 1 when the revised law approved by the National Assembly takes effect. In the revised law, the rate will be calculated based on the average selling prices of dealerships with set price frames. However, the range of the price frames has not been specified. Importers said there was not yet detailed information about the implementation of the law, even though it would come into effect in the next two months. They said their transactions were based on a period of six months, from receiving the orders to delivering vehicles to the customers. Therefore, in this time, they cannot quote an exact price in Vietnamese Dong for those who place an auto delivery order after July 1. “This will cause negative impacts on the auto importers’ businesses and reduce the State budget’s collection as well,” said the petition. With such difficulties, they asked the Government to keep the current method in place and delay the new tax calculation method until it is clearer. This petition was not the first time auto importers called for help from the Government. In November, 2015, eight auto importers sent a petition to relevant ministries about regulations on the calculation of special taxes, which took effect on January 1. This calculation has caused the prices of many cars to increase by 15 percent to 30 percent. The auto importers asked the Ministry of Finance to issue detailed instructions and a suitable time frame for them to apply the new tax calculation smoothly. They have also asked the ministry to host a public conference to get ideas from auto importers and domestic auto assembling factories before the new tax calculation is enacted. Under the Special Consumption Tax, there will be many changes on auto tariffs. Taxes on vehicles with low engine displacement will be reduced, while taxes will be raised for vehicles with high engine displacement of more than 2,500cc. In particular, vehicles with high engine displacement from 3,000cc to 6,000cc will be taxed from 90 percent to 150 percent. For example, the model Mercedes S500L is being sold at a retail price of 5 billion VND (224,900 USD). As of July 1, when the new special consumption tax rate of 110 percent is applied, a hike from the current 60 percent, its price will raise to about 6.6 billion VND.